Only those who rise to their calling discover why they were chosen. A thousand years ago, an order of twelve magic swords kept the world at peace. Each sword had a personality, a mind, and a memory. Through the bonds they shared with their bearers, the wisdom and skill of generations was preserved. But the swords became corrupted. They turned on each other, shattering the order and plunging the world into war. 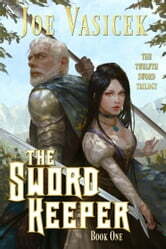 The twelfth sword went into hiding until the day of prophecy, when the last sword bearer would free the world of men. That day has come, and the sword bearer of prophecy is a mere tavern girl. Tamuna Leladze never sought for this honor. Raised by her aunt Sopiko, her only knowledge of foreign lands came from the travelers who passed through her aunt's tavern. She always dreamed of adventure, but never thought she would answer its call. But when a wandering knight arrives at the end of the harvest season, all that begins to change. The old knight is the keeper of the sword Imeris, who has chosen her in the eleventh hour. For far to the north, a terrible empire has unleashed a reign of blood, fire, and steel. Led by an evil brotherhood more ancient than the sword itself, their darkness will soon sweep the land. As events carry Tamuna far from her village home, she cannot help but wonder if the sword has made a mistake.